Shivering in the icy wind, he stood alone on the refuge island at the crossroad of West Cermak Road and South Clark Street. Out in the pitch darkness, the middle-aged man became visible under a dim streetlight. Being first-time volunteers for the annual Homeless Count, we hesitated. How should we politely approach him? But on a quiet winter night with little traffic, he easily noticed us and ran across the street towards us. The dusky streetlight shed light on his gray thick beard and the wrinkled face hidden under his dark blue hood. We explained how we were here collecting information about homeless people for the city. But he seemed perplexed, making a hoarse sound. He raised a hand to point at his ear and slowly shook his head. “I’m deaf. I’m homeless,” said a sign, which he held in the other hand. Luckily, there was one volunteer on the team who knows how to sign. With his help, we learned that the man came from St. Louis and has been homeless for one year. It was 11:26 p.m. on Jan. 24, the first coldest night so far in January. Without gloves, we felt the pain from fingers exposed to the cruel wind as we wrote down his age, gender, race and the place and time we met him on the tally for the count. 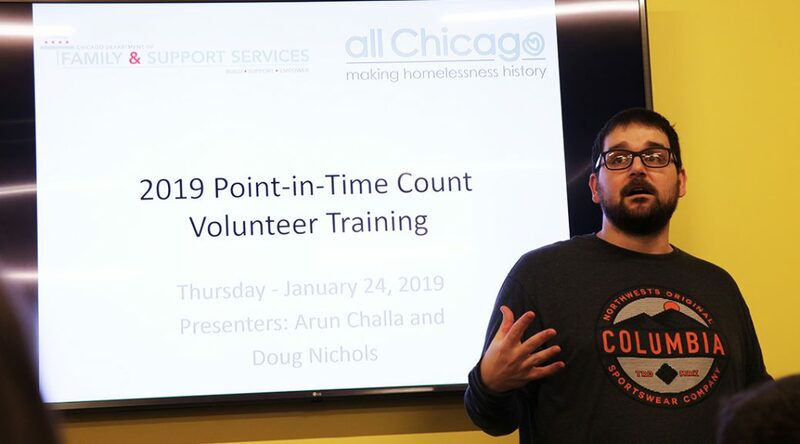 Together with two other volunteers, we were out driving and searching for homeless people in downtown Chicago from 11 p.m. to 1 a.m. for the 2019 Point-in-Time Count of Homeless Persons, an annual count since 2005 organized by the Chicago Department of Family and Support Services (DFSS) to better understand the homeless population and needs in Chicago during a few hours on one given night in January. The data offers an important direction for federal funding, homeless service and resource planning. Many non-profit communities use the Point-in-Time data as a reference to address homelessness issues such as needs for more shelters, said Evan Cauble-Johnson, the chief development officer in Inspiration Corporation, a Chicago-based social enterprise that helps homeless people find housing and jobs. 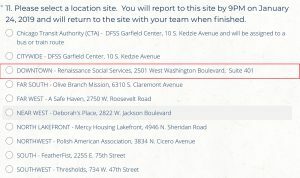 Julie Dworkin, the director of policy at the Chicago Coalition for the Homeless, however, said the survey is inaccurate during an interview with WBEZ that morning. “(Volunteers) actually try to do a visual eyeball count of people, which you can imagine is a very difficult and inaccurate way to really capture the problem,” Dworkin said. According to the results of 2018 Point-in-Time survey, there are 5,450 homeless people in Chicago, based what the U.S. Department of Housing and Urban Development (HUD) defines as “homeless” – people who live in a place not meant for human habitation, such as underpasses, emergency shelters, transitional housing, or temporarily shelters in the institution they are leaving. Chicago’s homeless population totals more than 80,000, according to estimates made by the Chicago Coalition for the Homeless, Dworkin said during the radio interview. This includes the “doubled-up” population of people who live with others without their own houses, a different definition from what HUD uses. Often, even that resource is temporary. Where to find them – this was the biggest question that hung with us through the whole night. During the two-hour search, the deaf man was the only homeless person we encountered. It unsettled us that we might miss someone since we didn’t know clearly where to find people who may sheltering somewhere unnoticably to keep warm on a freezing night. And maybe they just preferred to hide from us. But that was not the only unresolved question after a training session conducted earlier that night. 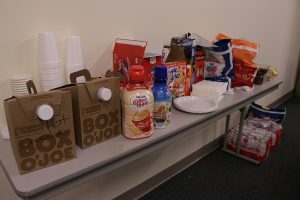 The session was delivered on the fourth floor of Renaissance Social Services at 2501 W. Washington Blvd by and DFSS and All Chicago, a non-profit organization addressing homelessness in Chicago. Around 50 volunteers gathered and prepared to head downtown, one of the 10 sites across the city. Volunteers were divided into groups after the training. Each group with three or four people assigned an area within a larger region such as downtown. We received three maps – two for Chinatown, one for Goose Island – with locations that were far away from each other, making it almost impossible for us to thoroughly search the areas within the time limit. “It’s my first time to do this much,” said T.J. Thomas, one of our group members who has volunteered for Homeless Count for eight years. We gave the deaf man, the only homeless person we met that night, a box of food and an emergency contact card including contact information of police stations, hospitals, emergency shelters and housing providers. “Me home?” he stared at us unbelievably. “Oh, house!” He nodded his head heavily. His face was flattened with joy. We were not that happy. He could call the number, but it is doubtful whether he has a phone. Even when he calls, he could not be picked up on the street. He needs to go to a police station or an emergency room and may wait for a long time. The nearest police station was a mile away. We knew clearly how far away he was from a home. But he seemed hopeful. He gave each of us a big hug. “God bless you!” he repeated several times.